The three best active heavyweights in the world today are arguably: Anthony Joshua (biggest win a KO over Wladimir Klitschko), Deontay Wilder (biggest win a decision over Bermane Stiverne) and Luis Ortiz (biggest win a KO over Bryant Jennings). And, in an ideal world, these three rivals will meet and settle their differences of supremacy once and for all. We fight fans know we are living in an age where fighters say the right things, they talk tough and they say they want to fight the baddest and the best, but do they really mean it? If so, and if we can take IBF/WBA champ Joshua at his word, he does want to face his second mandatory in a row after he has (presuming he wins) dealt with IBF mandatory Kubrat Pulev. AJ stated at yesterday’s presser to hype the October 28 defence against Pulev how he will not look to duck Cuba’s Ortiz, his WBA mandatory. Joshua wants all the belts, and he says he will fight whoever to make sure he gets his hands on them. But in today’s boxing world it’s not just about whether or not fighter A wants to face fighter B. No, it’s not so simple. Ortiz is also in negotiations for a shot at Wilder’s WBC belt, and we are wondering if Ortiz will take the WBC route or wait until next spring and take the WBA route. 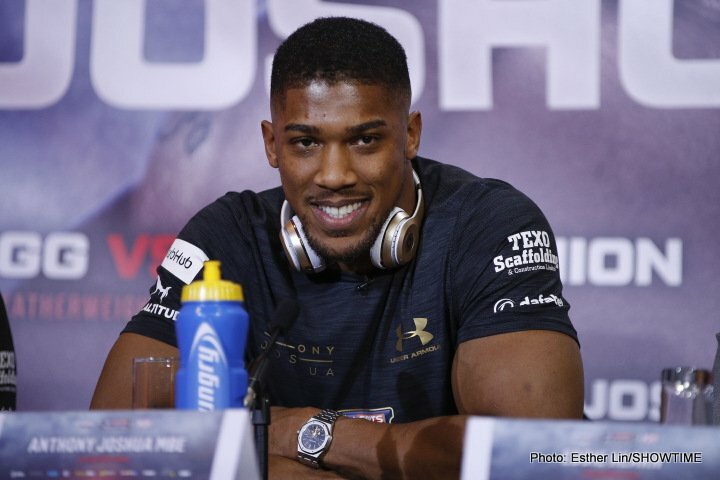 Both fights, Joshua-Ortiz and Wilder-Ortiz, are exciting possibilities, but which will we see? And if Ortiz does decide to merely sit and wait for his assured shot at the WBA belt AJ currently holds, then who will Wilder fight next? Wilder, his fans are painfully aware, has not fought since February, and he has boxed just twice over the last 13 months. Wilder might just be the most dangerous, the most exciting heavyweight on the planet, but he has got to get going as far as staying active goes. That really is that simple. But Wilder finds himself in a pretty tough spot: he wants, he says (and we believe him) to fight Ortiz next – even agreeing to pay his WBC mandatory Bermane Stiverne step aside cash to allow the fight to happen – but Ortiz, amazingly, has more options than Wilder does. We must now wait and see what Ortiz decides; either a shot at Wilder or a shot at Joshua. Things will get even more confusing if Pulev shocks the odds and derails Joshua next month. At least we fans can get ready to see some interesting and exciting heavyweight fights. The division is moving in the right direction again, sort of.